The paint on the metal spiral bindings of the address books and journals can contain excessive levels of lead. 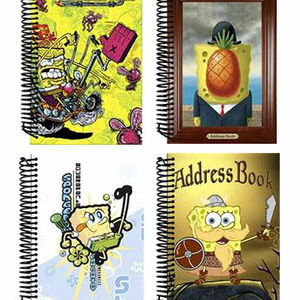 This recall involves about 250,000 address books and journals with SpongeBob SquarePants characters on the front cover and a black metal spiral binding. The UPC numbers (80773007505 for the address book and 80773002260 and 80773075501 for the journals) are printed on the back covers. Retail stores nationwide from June 2006 through July 2007 for about $2. Take the recalled address books and journals away from children, remove the UPC as proof of ownership, and contact Martin Designs Inc. for a full refund. For more information, contact Martin Designs Inc. toll-free at (866) 898-0261 between 9 a.m. and 5 p.m. ET Monday through Friday, or visit their Web site at www.martindesigns-ltd.com.